Cake Pops are all the rage at the moment. There are so many fancy designs you can do to suit your party theme. They can make great centre pieces to a table and can really impress. 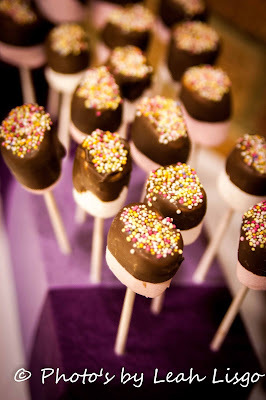 If you're new to making cake pops like I am and want to give something a go, these marshmallow pops are a good place to start. OK, technically they're not cakes, but they are on a lolly stick. Melt the chocolate according to the directions on the bag. Flavour with extract if you like. Place upright in florist oasis or polystyrene until chocolate hardens. These are so easy and quick to make. You can select the sprinkle colours to match to your celebration colour theme. They are perfect for little hands to make too. You need to purchase some lolly pop sticks. You should be able to get them from any sort of craft store, I purchased mine from The Range. You need something to stick the lolly sticks in to allow the chocolate to set. I used florist oasis foam, which again you can get from craft stores and homeware stores. You could also use polystyrene if you have some laying around the house. I tried using an egg box upside down, but the sticks wouldn't stay upright. A little tip if you're using florist oasis. This should come rapped in plastic. Keep the plastic on so any chocolate that drips goes on the plastic and not the oasis. Once the chocolate has dried, remove the cake pops and place of a plate or board. remove the chocolate covered plastic from the oasis and then wrap the oasis in tissue paper. You can turn the oasis upside down so the holes you made are now at the bottom. You can tie the tissue paper in with the colour theme of the party or event. As you can see from the photo I used purple as that was the colour theme of the wedding.